As I'm sure you will have heard by now, it has been confirmed that the long-speculated He-Man movie has finally been confirmed and will be directed by rookie director John Chu. John Chu. The man behind such timeless classics as Step Up 2, Step Up 3D, and Justin Bieber: Never Say Die. Yes, you may want to read that last sentence again. Before you concern yourself that the fact this film is being piloted by a, for lack of a better, "drivel-churner", take a deep breath and fear not. Chu has made some stinkers, true, but there's no need to pigeon-hole him. Technically-speaking, he knows his way round a camera very well, and lest we not forget the great directors that have preceded him and also coughed up film rubbish ( Robert Rodriguez, Spy Kids 3, enough said). Despite the questions raised about the director, there is no denying that The Masters of the Universe film, and the inevitable sequels, are going to be huge. Super Hero films are at an all-time high with the likes of The Dark Knight Rises and Avengers Assemble smashing box office records like a big green rage monster. Combine that with the nostalgia factor that rocket-boosted the Transformers films and you have a money-making titan-in-the-making. Sure, the hulking body, the long-flowing, blonde locks, the capability to wield a magical weapon; He-Man may not be Thor, but he's as close as your going to get. Maintaining that logic, Liam Hemsworth may not be his brother Chris, but he's as close as your going to get. The younger of the siblings hasn't had a huge amount attention yet (the new Expendables ought to change that), but he has proven he can hold his own in a major franchise, being the main reason teenage girls have gone to see The Hunger Games. He-Man doesn't have to be a super-genius, he just has to big, built, and good through an through. Enter Hemsworth Jr.
Skeletor was arguably the biggest and best villain of the 1980's (must...resist...Thacther joke). 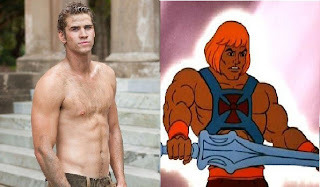 He may not match his archenemy's power and muscle, but in terms of cunning and conniving he far surpasses He-Man. and you don't get much more cunning than Sherlock Holmes. Cumberthatch is an enormous talent, anyone can see that, and it is only a matter time before he leave our shores for Hollywood success. He's not the obvious choice for the evil lord of Snake Mountain, given he's never really been tested as a villain, but I think he'd have enough inner-complexity and panache to pull off a twistedly evil performance. 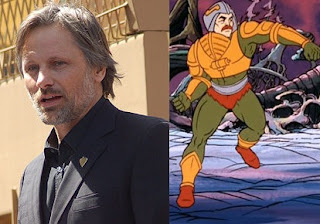 One of He-Man's most important allies, Man-at-Arms will almost certainly feature in the upcoming film. A weapon's specialist, he often acted as a voice-of-reason mentor figure to He-Man. Call me crazy, but I think the entire blockbuster scene has been suffering from Viggo's absence since Return of the King. Now ten years older since his last excursion to Mordor, he's nestled nicely into the mentor figure age. We already know he can wield a sword, and I bet he could grow a fantastic moustache. Skeletor's foremost henchman, Tri-Klops had the curious ability of rotating his eye to change it from a circle, to a triangle or square. Random. However, the character was a formidable and towering foe. 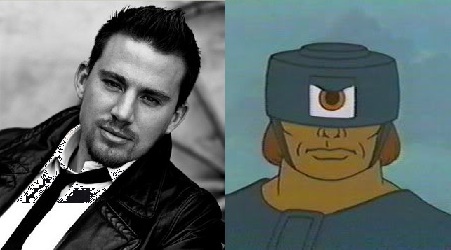 Tatum may not be a classic villain, but he is a linchpin of John Chu's films (Step Up, GI Joe). Plus I'm sure he'd jump at the chance give that Tri-Klops' costume shows his abdominal region off. The only female in Skeletor's band of villains, Evil-Lyn is the evil sorceress bringing the glamour to Snake Mountain. Hathaway has the looks, and as The Dark Knight Rises proved, she has that whole layered-intensity going on that would be perfect for the role. Unlikely she'd hop back in to the comic book genre straight away though, especially for a part far less iconic than Catwoman. One of the most instantly recognisable He-Man villains, Beast Man was first characters ever to be created for The Masters of the Universe. He has the strange ability to control all animals. Well, I say all animals; all animals except Cringer/ Battle Cat, for some reason. Gerard Butler certainly has the raw testosterone for the role. Nobody does big and gruff like Butler, and can't you just hear it now: "This. Is. Snake Mountain!" At the ripe age of just 28, Olivia Wilde is fast becoming something of a veteran of the Sci-Fi/Adventure genre, turning in solid performances in Tron: Legacy and Cowboys vs. Aliens. A film such as He-Man would be right up her alley, and no role would suit her more than that of Teela, He-Man's trusted friend and potential love-interest. What's a major movie franchise without a genius cameo? Unfortunately, it wouldn't make much sense for Marvel man Stan Lee to do one of his classic walk-ons. 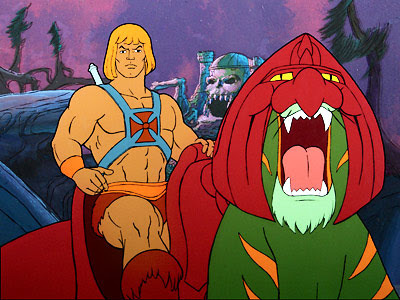 So why not have a He-Man cameo, by He-Man himself. Yes, as some of you will recollect, two years after he was Ivan Drago, Dolph played He-Man himself in the Prince of Eternia's last big screen outing. Who better then to play He-Man's father, King Radnor in this new depiction?